MMT does ChillOut Parade at Daylesford! 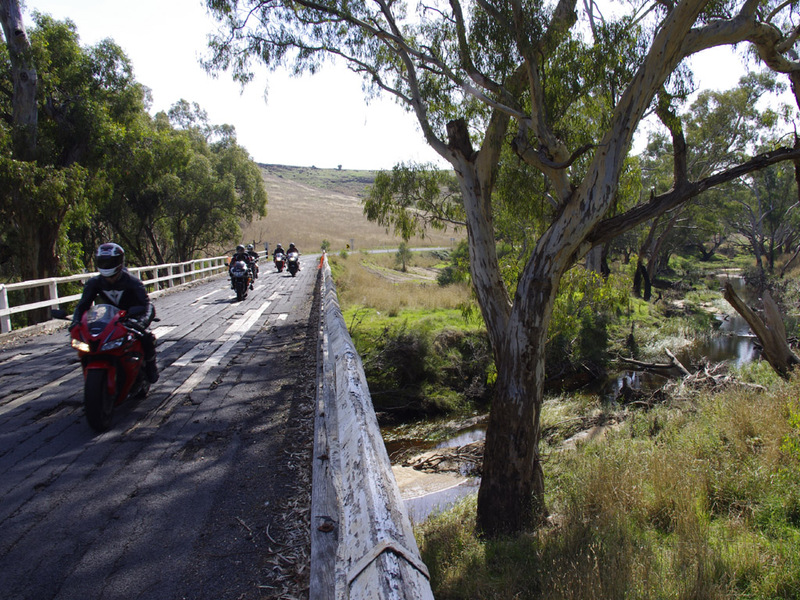 This ride report was originally published in the April 2012 issue of the Motorcycle Tourers club magazine, ‘Chain Lube’. I put my hand up to lead the MMT ChillOut 2012 ride after Michael Van Scooter (in his usual subtle way) suggested that it had been rather a long time since I had led a ride and that it might, just perhaps, be about time I shouldered part of the burden of keeping the MMT ride calendar booked. With ChillOut needing a ride leader and me keen on holding the MMT ride-leading baton for the shortest possible time, I put my hand up for ChillOut. Or CopOut, as I thought of it at the time. I mean how hard could it be? Just show up at South Yarra at some godawful early time, shepherd the group out onto the Westgate Freeway, shoot up the Western Ring Road to the M8 and then you need only remember to turn off at the C141 (ahem, David) and you’re there. Then a few trips up and down Vincent St, smile, wave, park bikes, knock back a quick coffee or two, and then watch your whole ride group head off to Carnival and free you of the burden of leading the ride back. Then you just sneak back home on the freeway, getting home in time to put your feet up in front of Gardening Australia on ABC1 at 1:30pm. Easiest ride leading ever! Just on the offchance that I did have some punters for the return journey, I decided to line up a return route that had a reasonable quota of winding roads and nice scenery, which I did by basically going to an online map of the area and looking for road routes that were squiggly rather than straight. I took the Friday before the ride day off work to do a pre-ride and make sure the roads actually existed and were actually bitumen. Not only did they exist, I found they were actually rather fun. In fact, very fun. 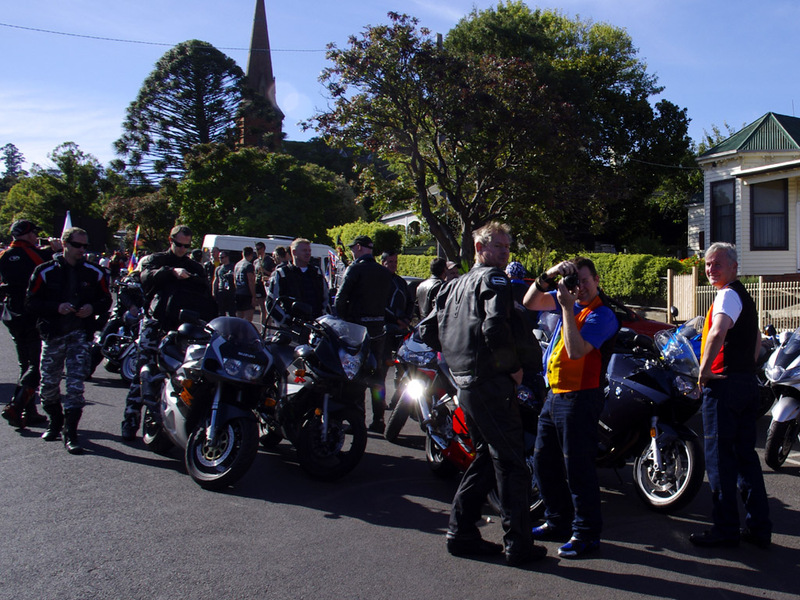 So much so, I began to actually encourage others to consider coming along for the post-Parade ride back to Melbourne via the road less travelled. Sunday dawned with a near perfect weather forecast: sunny, 25C expected maximum, light southerly breezes at most. I headed down to South Yarra at 8am expecting to find no-one in their right mind to be there at such an absurdly early hour, and was arguably proven right when I found only Max and David Wi. They were relaxing over coffee and looked so comfortably settled in, I can only assume they got there at about 6:37am. However before too long we had Fab and Arron arrive, and at least five full minutes ahead of our scheduled 8:30 departure we saw Peter Ho and Tim arrive. Yes, early! An uneventful journey through the freeway network took us out to our second pickup at Ravenhall, where my better half Brett awaited with a goodly assortment of Tourers, including Dewy and Stephen, and Simon. 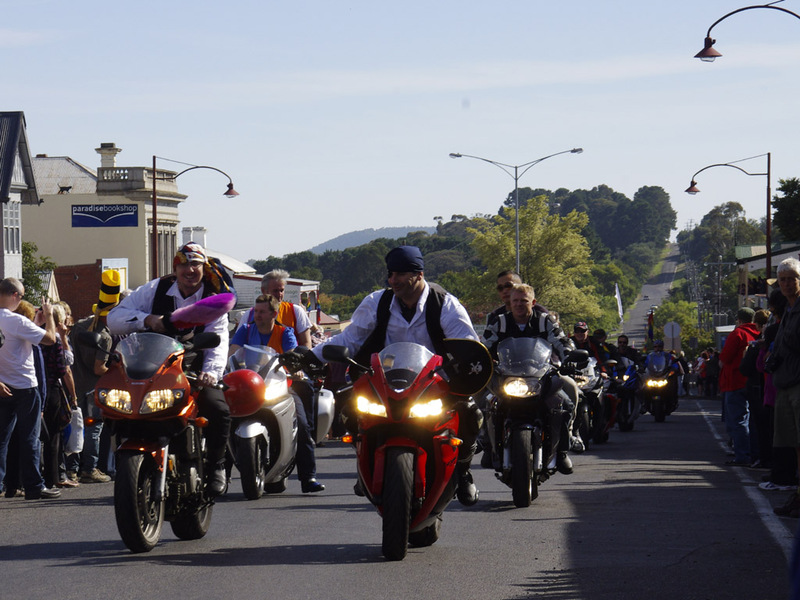 Brett advised that Moff and Adz had gone up directly to Daylesford earlier, with Moff needing several hours to allow for extensive redecoration of the Maj.
We set off and quickly passed through Melton, Bacchus Marsh, and then prepared ourselves for the difficult task of turning off at the turn-off marked “Daylesford”. Somehow we managed to achieve this feat, and before long we were winding our way north along the gentle curves of the C141. 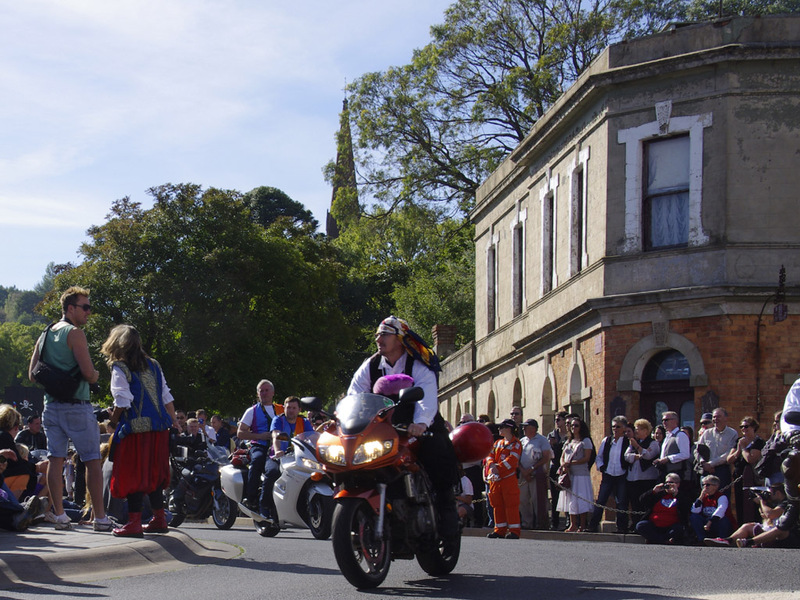 Our confusion about the order of the ride was soon overtaken by our delight at seeing yet more Tourers there to ride in the parade, or cheer from the sidelines. 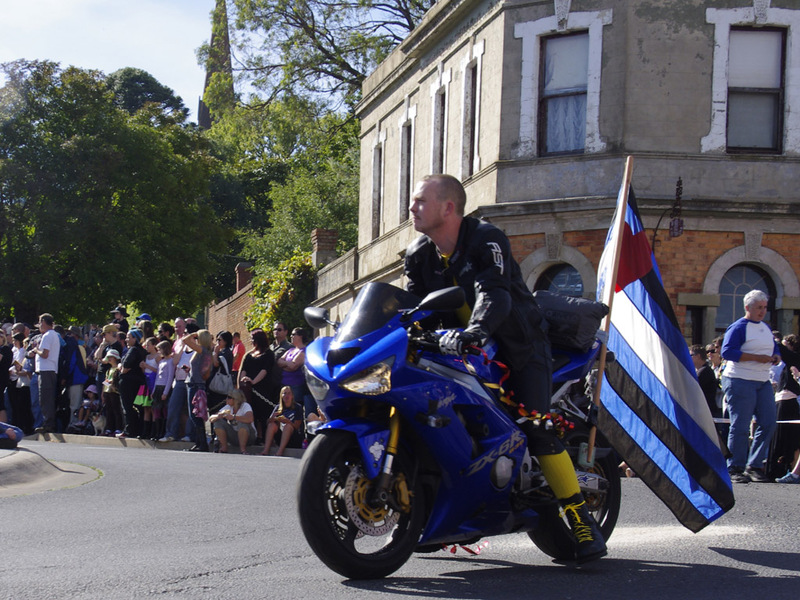 We had the lovely Nathan (wearing skintight leather trousers that I suspect were not purchased from Peter Stevens) who had equipped his ZX6R with a leather pride flag large enough to have its own postcode. We also had Dan on the gunmetal SV650S with Megacycle exhaust, its testosterone infused v-twin rumble showing Brett what the copper SV with factory can is missing out on. 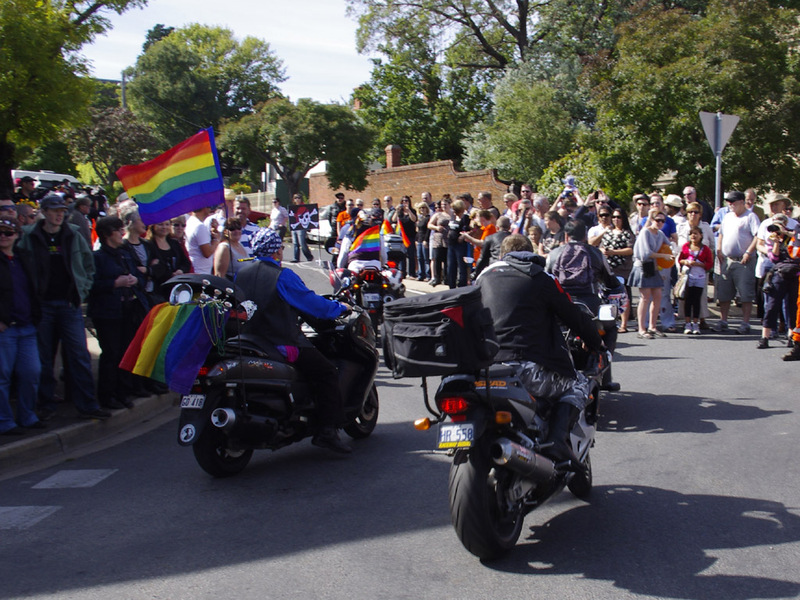 We had Adz and Ian on their man-size Triumph ST looking very dapper in their matching rainbow waistcoats. And we had Gary and Michael, who arrived from Chewton in a car somewhat smaller than Adz’s new Triumph. Apologies if I’ve missed anyone in the roll call, I may not have seen you with my pirate eyepatch on! Arrr!!! 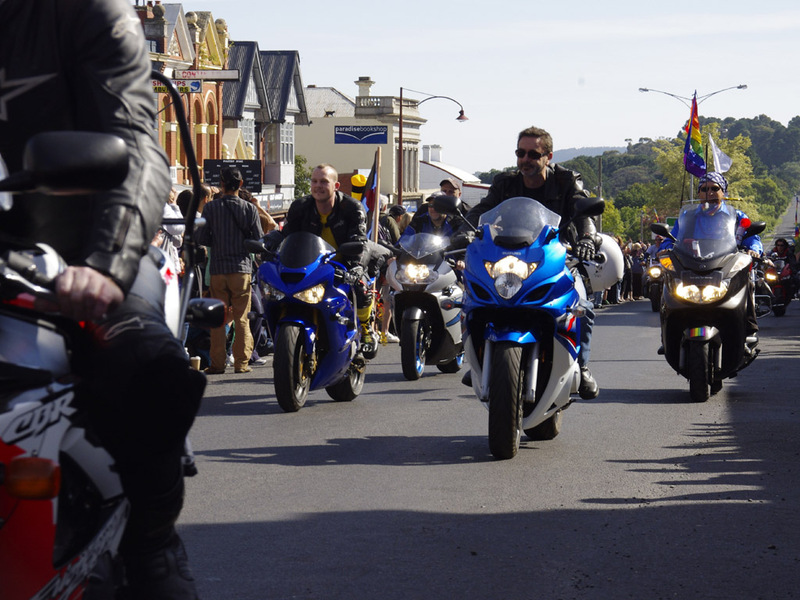 We are indebted to Gary who agreed to operate Brett’s 37kg Single Lens Reflux camera as we rode in the parade. Gary managed to snap quite a few great shots of the parade, and no shots of my double chins. Well done! 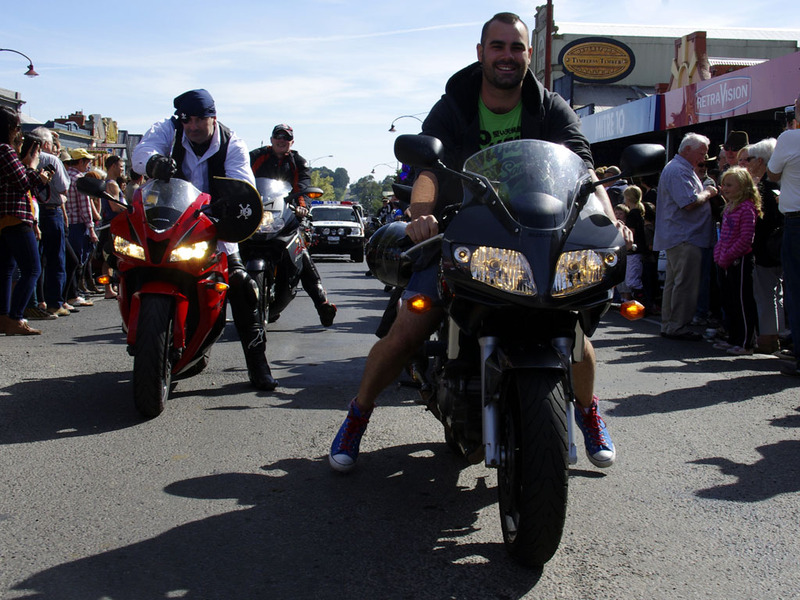 This year we and the DOB were asked to warm up the crowd with three laps of Vincent St prior to the main parade going through, and were then asked back for yet a couple of extra laps. Five laps of riding at about 10km/h left me with a very sore clutch hand (lucky I’m right-handed!) and the CBR with a temperature gauge hovering around the 104C mark. We refuelled in Chewton, where I managed to pay for three other people’s fuel as well as my own. We hopped onto our bikes and Arron then started his in expectation of imminent departure. I asked him to please turn off the engine and advised that although it LOOKED like we were ready to go, in reality Peter Ho hadn’t yet paid for his petrol or put on his helmet, and I further explained that typically just when you think he’s finally ready to go, Peter will suddenly decide that his gear bag needs opening and re-sorting. Sure enough, right on cue, Peter headed from the cashier straight to the rest room and then when he finally made it to his bike, opened the gear bag to rearrange things! From Chewton we headed off the main road in the direction of Redesdale via Sutton Grange. 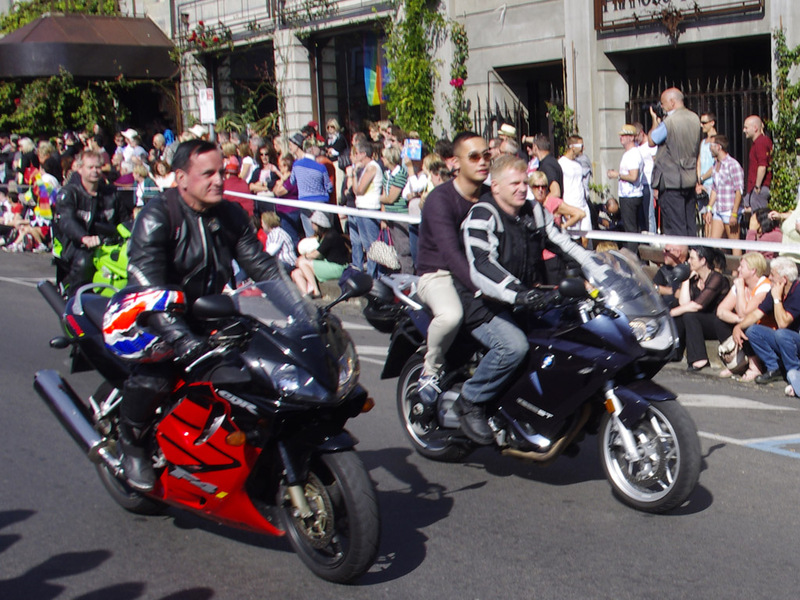 As is well known by anyone in a motorcycling club: if you didn’t take photographs of the ride then it never happened! So when we regrouped at the interchange with the Calder, I directed Brett to ride ahead for some ride-by photos. Unfortunately Brett immediately rode off on the Bendigo (rather than the Redesdale) road and I went off in hot pursuit to catch him. The other riders duly followed, and my frantic hand waving at Peter which was intended to indicate “please wait here until I return” was unfortunately mistaken for frantic hand waving indicating “please follow me as closely as possible”. 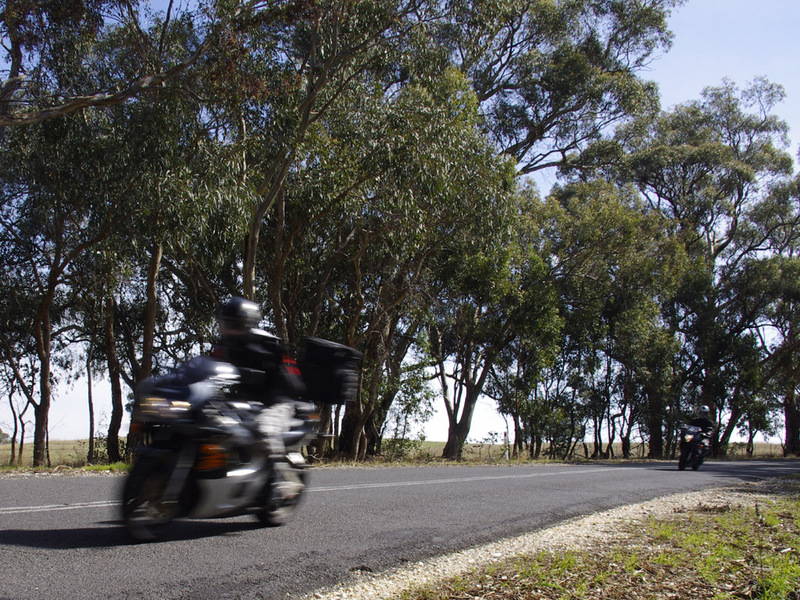 A brief stint of riding at #@$ km/h and I managed to catch up with our errant photographer who, fortunately, did understand my frantic hand waving for “please pull over somewhere between here and Swan Hill”. So there we have it, despite my best attempts to run a U-turn free ride, the curse of Parrington struck again! Soon we were back on the road to Redesdale which has a few entertaining curves along its length. Brett managed some nice photos of us as we crossed the Coliban River on a bridge made out of recycled weatherboards and fence palings. We then turned right at Redesdale towards Kyneton, but then deviated on another rather entertaining little road (Watchbox Rd) which took us to the Burke and Wills track, a vastly more interesting North-South route than the M79 or the B75 which roughly parallel it. We finally arrived in Lancefield and enjoyed afternoon tea in a combined cafe/gallery with comfy sofas. It was here that we bade farewell to Fab and Arron, who had to head back to Melbourne to head out for a big night out on the town. (We later found that they fell asleep about half an hour into it!) 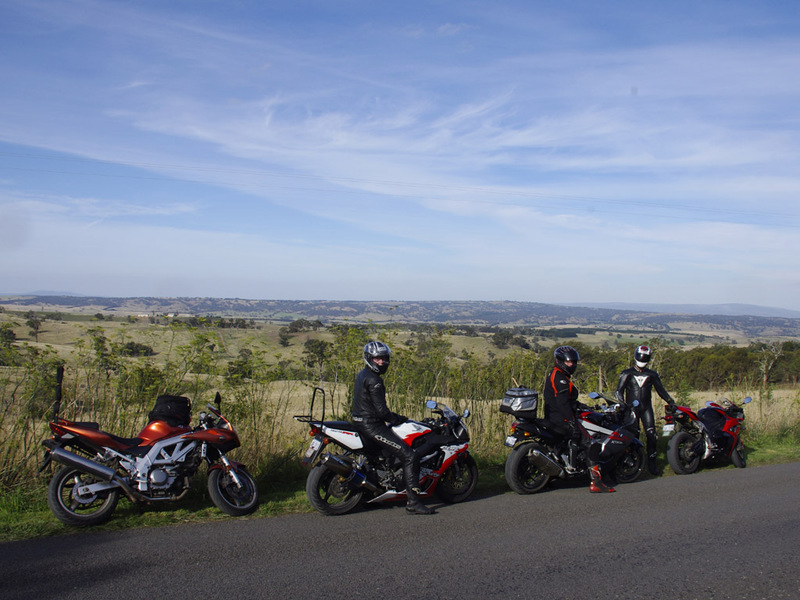 So it was just four of us (myself, Brett, Peter Ho and Tim) who got to enjoy our last bit of riding entertainment, with a left turn at Romsey taking us along the Daraweit/Romsey Rd to Wallan, which has a some glorious sweeping curves as it winds its way east along the Great Dividing Range. 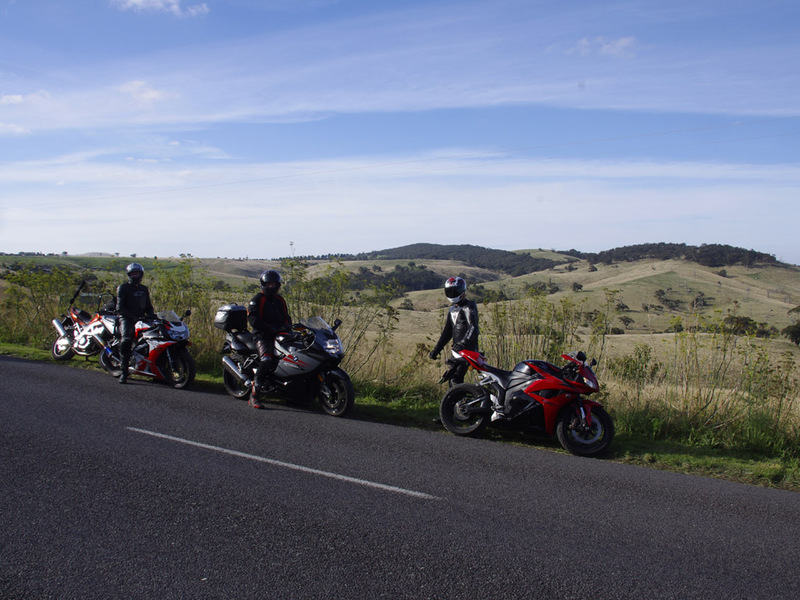 We rode on towards Whittlesea, eking out the last of the winding roads as the hills finally petered out into the plains of northern Melbourne. 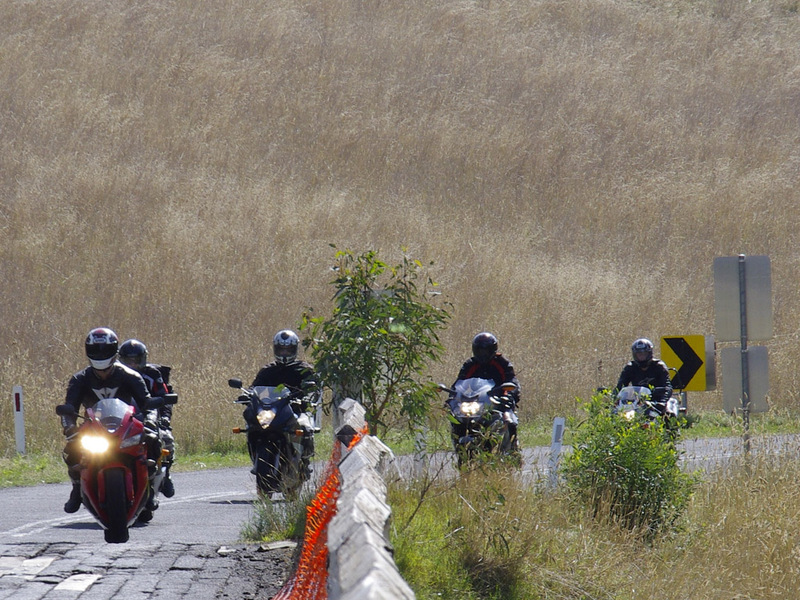 We headed west on Donnybrook Rd to the M31 and surrendered to boring freeway riding just north of Craigieburn. Thanks to all who attended the ChillOut parade (either as a spectator or a rider) and my thanks to the gang of four who accompanied myself and Brett on the scenic trip home.